Loyalty Deadline Midnight Tomorrow... Get in for All Draws! Published on May 8, 2018 at 9:00 pm . LONDON, ON, May 9, 2018 — Tickets are selling fast in the Dream Lottery and with its Loyalty Deadline midnight tomorrow, you don’t want to miss your only chance to qualify for all draws! 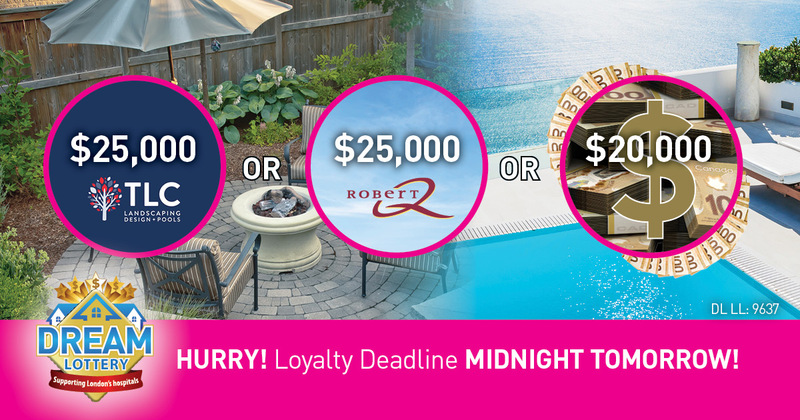 You win, you choose in the Loyalty Draw – a $25,000 ‘Staycation’ OR a $25,000 ‘Vacation’ OR $20,000 cash! Order now and qualify for ALL Draws, including VIP, Bonus, Early Bird and ALL final draws of vehicles, vacations, cash and so much more! Visit the Dream Lottery’s website to order tickets, participating Shoppers Drug Mart locations, or order by phone by calling 1-866-802-4117. Including 1 of 3 Dream Homes! Imagine walking to the beach, swimming in your pool, a putting green in your backyard and so much more OR there’s always the option of $1,000,000 Cash! PLUS … we have the largest 50/50 jackpot in Ontario that you can still order tickets for and there’s a Dollars & Destinations Calendar with a winner every day in August! So much to win! Supporting London’s hospitals that provide specialized, complex and critical care for patients from across Southwestern Ontario region … It’s a WIN-WIN!